Some find the movie a great mind-trip, spurred on by the psychedelic final sequence in which the main character, Dave Bowman, after disabling Hal – one of the most-chilling scenes in cinema history – travels through some portal in Jupiter-space to wind up in what amounts to a giant alien zoo, where he is the spectacle. Given the lights and colors and sounds, it’s no wonder if was something of a counterculture phenom. However, others find the movie incomprehensible and overlong, thinking the movie takes a millennium to watch, even though it’s only 140 minutes long. Though Stanislaw Lem’s novel Solaris predated the filming of 2001, when Andrei Tarkovsky adapted it into a movie, and after it came out, the film looked to be something of the Russian answer to 2001. After all, both films started with lengthy sequences on earth, switched shortly to space and had plots that were somewhat difficult to resolve. And though Solaris was well-regarded enough to warrant the Criterion treatment – something which Michael Bay has warranted, for good or bad – this is where the similarities end. Solaris is a leisurely paced movie, but this, in itself, does not turn me off. No, I’ve long enjoyed movies that move at their own pace and prefer to weave a tapestry of hypnotism rather than push an actual plot. This is probably why I am an avid Werner Herzog devotee and I find Terrence Malick’s films glorious. However, part of enjoying their films is the fact that, in general, they seem to understand that a movie of their type cannot go on forever. As such, they keep their run times short. The relatively plot-less Badlands and Aguirre, the Wrath of God run barely 90 minutes; by comparison Solaris runs a bloated 165 minutes and actually feels like twice as long. The problem isn’t running time, necessarily – Malick has since gone off the deep end on run times but this has not negatively affected his films – it’s what’s done in the run time that’s the problem. To begin, Solaris, as told by Tarkovsky, is a self-indulgent mess. It’s long, I’ve said that. But long doesn’t even begin to describe it. 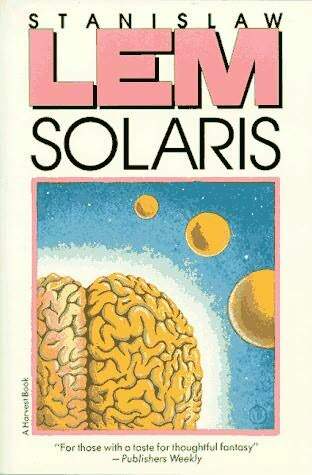 I’m patient as the day is long and willing to cut a movie some slack but Solaris required four sittings before I finally got through it and it might have required a fifth if I hadn’t been determined to jam my way all the way to the end on the fourth session, just to be done with it. Beyond the issue of length is the problem of a complete lack of focus. The film opens, like many Herzog films, with a lengthy shot of weeds swaying in a stream and then follows a man taking a walk around a stream or a pond whilst a wild horse runs by. Later, after sitting through a lengthy home-movie of a press conference/legislative inquiry thrown in only for expository purposes, we see the man from the home movie driving the streets of an unnamed city – it was actually Tokyo – without ever getting an explanation of where he’s going or what he plans to do once he gets there. All of this occurs before the main character finally arrives at Solaris nearly an hour into the film, and the plot – about the power of the planet – even gets going. Thirty years later, Steven Soderbergh had a go at a remake. Advertised as an action adventure sci-fi movie, maybe even a romance, Soderbergh’s Solaris was as reviled as the original was adored, probably because the people who queued up for it thought they’d been the victims of a bait and switch. They came expecting a straight-forward sci-fi film and what they got was a meditative film with big ideas and unanswerable questions. However, as maligned as the remake is, it is actually the superior of the two films for the simple fact that the remake does everything the original set out to do in almost half the time – coming in at an austere 99 minutes – and did it better. In the original there is no Jeremey Davies, nor is there the sense of paranoia and difficult questions that his subplot adds to the mix. The remake also has George Clooney, who is far superior to his counterpart in the earlier film. If there is any part of the original that surpasses the remake it is only the ending. Soderbergh preferred to let the film end on a dreamy and ambiguous note while Tarkovsky, finally, after nearly three hours, is explicit and to the point about just exactly what the outcome is. But by then, it feels like a little bit of too-little, too-late.